A curated marketplace connecting food lovers with the UK's best small batch independent food and drink producers. We search the country looking for the most exciting producers hand crafting incredible food. We champion "real food"; food made with passion by hand and using carefully sourced local ingredients. We believe it's better for us and better for the world we live in to enjoy food that way. 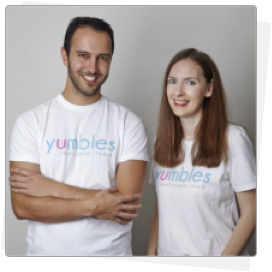 Yumbles was founded by husband and wife team Simos Kitiris and Katie Kitiri (confusing surname variation, we know!). With backgrounds in various online marketplaces and technology businesses, they are combining their passion (borderline obsession) for great food with their professional expertise to bring a new and exciting way to discover and buy independent, hand-crafted foods.